Situated on the one-way ring road around Santiago del Teide, TJs bar has quite a high profile in the Los Gigantes area, mainly because it offers a superb package of entertainment. Despite this reputation for lively, fun-filled evenings, the bar offers itself as a daytime venue, too and sort of divides itself into "daytime TJs" and "evening TJs". During the day, the bar bills itself as serving "bar snacks", but this doesn't really do it justice. On offer is a comprehensive selection of traditional Spanish tapas, as well as British staples, such as sandwiches, toasties, tortilla wraps and baguettes. So, if you want to eat more like a native while enjoying a drink, you could try, for example, chorizo, Serrano ham, chicken skewers and goat's cheese with red peppers. It turns out that these dishes are a bit cheaper than the British stuff, so there's an extra incentive! The "daytime" persona of the bar continues, appropriately enough, until the sun goes down, then the "evening" side of things kicks in. Now, TJs comes into its own, with a superb entertainment package. The bar is run by Joanne Love, who also gets up on stage to sing a few songs. An Irish lass with a wicked sense of humour, she's guaranteed to have you in stiches. At around 9:30pm, the guest cabaret takes the floor and TJs bar is always careful to employ only the best Tenerife entertainers. You'll be able to catch a different act, every night of the week. 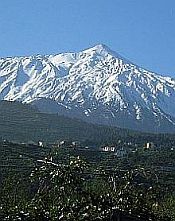 To find the bar, get yourself on the one-way ring road around Santiago del Teide. In the direction of the traffic, watch out for the huge Hotel Stil Los Gigantes on the right. TJs bar is just to the right of this.